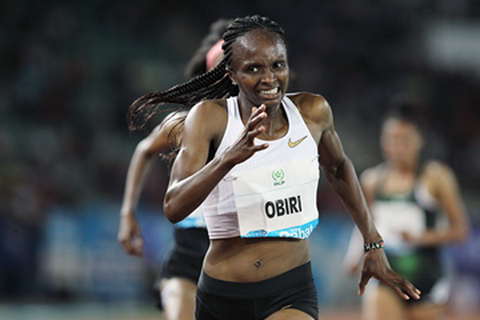 Hellen Obiri produced a fine run as she sped to finish first in 5000m women at the IAAF Diamond League Meeting in Rabat on Friday night. Obiri clocked 14:21.75 to record her thirteenth quickest race and overcome her closest rival on the evening, Dutch Sifan Hassan who hung on her to finish second just a second later. The race began with Ethiopian SenbereTeferi taking a strong lead with a pack of six following her well up to the 3000m mark in record 8:41.15. However, Obiri left the pack to take over with slightly over 1000m to go but Hassan could not let her alone. Teferi determined to not let her lead go fought back to take the lead from the pair in the final lap. However, it was Obiri who finally was able to pull away from the four rivals to cruise to the finish line, with only Hassan putting on an equal fight to finish second. Ethiopia's Letsenbet Gidey finished third in 14:23.14 to push Teferi further fourth as she faded towards the finish line. Another Kenyan, Agnes Tirop finished fifth clocking at 14:24.24. In another race of the evening, Kenyan Benjamin Kigen led in the 3000m men steeplechase. It was only the second appearance at the IAAF Diamond League and the second year on the international circuit but the 25-year old was already causing seismic waves. Kigen, a soldier, clocked 8:06.19 an improvement of almost three seconds compared to the victory he got at the Diamond League meeting in Eugene with a personal best of 8:09.07. First, it was a slow pace that the leading pack set, then it was the Moroccan fans who were up crazy anticipating a win from their own Soufiane El Bakkali. for a moment El Bakkali looked like the guy for the first place. It wasn't to be though, as Kigen and his Ethiopian counterpart Chala Beyo, surged forward in a determined pace past the guy from the Maghreb to the agony of his raucous fans. Kigen then easily shook off Beyo to bring the victory home. The World and Olympic champion Conseslus Kipruto had a bad day but eventually finished 12th.